Sharing what we do, answering your questions. We like to learn from you too! This is my all time favorite honey! We are so happy we got our bees in this field! It is sooo sooo gourmet! My Sweet, Supermom, enjoying healing Turmeric tea! She taught me sooooo much about healthy, herbs, plant-based living! Thank you MOM! I have been thinking alot lately about how to get maximum results for my family, friends and clients, when it comes to unleashing the healing power of turmeric. This little asian root, related to ginger has been used for centuries as food and medicine. So much of our food has been our medicine for millenia, as it should be. This is real health care, not sick care so much, but that also, but prevention is the best health care. Science is now discovering the power of plants as medicine, as preventive agents and is unlocking some of the Creator's secrets, I want to stress SOME, we may be making wonderful discoveries but for every new star we discover, there are gazzilions more undiscovered, the same goes for galaxies and also for the micro world. Creation is a vast field of study that can not be exhausted. So, I have been mulling over some alternative ways to get the benefits of Turmeric into humans in a pleasant way. I know that the turmeric root capsules are useful, but there are components of turmeric that are not absorbed, and all its potential is not unlocked unless there is a source of heat, a catalyst, like cayenne pepper and some fat. Asians of course consume much turmeric in their curries where the root powder is boiled(heat), contains hot peppers, and coconut or other oils. Their heavy use of turmeric translates into less Alzheimers and some protection against certain cancers. The capsule does not offer all these benefits, curcumin on the other hand is even found at times to be no better than a placebo when compared to using whole turmeric. This is where my healing tea came from and I want to share the recipe here today. I want to thank Dr. Gregor of nutritionfacts.org for supplying so much useful information! Here is a link to just one of his short talks on Turmeric and Alzheimers. Bring to boil first 4 ingredients. Cover. Simmer 10 minutes. Turn off, add remaining ingredients. Let steep at least 20 minutes. Strain. Enjoy between meals. 1 hour before a meal is a good time to drink the tea. Drink 1 quart a day. This formula contains other plants which we will discuss on a different post. Try the tea, let me know what happens in 10 weeks. So happy you joined me today! Have a blessed day, Marline. I went to a wonderful health education seminar geared toward professional a couple weeks ago. 2016 EQ Summit. Several physicians, scientists, psychologists and nutritionists were featured. The information was phenomenal! One thing I want to share with my friends today, from the Summit, is that contrary to media, most information out there, whole turmeric works better than the curcumin extract! It makes so much sense! The whole food is greater than its parts!! Another thing is that if you make a tea or heat the turmeric powder, add a little dash of cayenne, you have a more active form of turmeric. Soooooo, my recommendation: When you make a tea, any tea, like chamomile, peppermint, verbena, whatever, add some turmeric powder to it (1 tsp per quart) let it steep, drink throughout the day and reap the powerful anti-inflammatory, anti-cancer, anti-oxidant benefits of this humble root, a gift from the Creator!! Let me know how it helps your joints, urinary system, skin, sleep, stress, hormone balance, helps you quit smoking or drugs, foggy thinking, alzheimers all this will improve. Give it 8 weeks for results, but you will feel/see a difference sooner. God bless you my friends! Try this recipe and you will see how the family loves it! I remember as a child waking up to a cough and having trouble sleeping because of it. This of course would waken my dear mom and often she would come to my bed with a little spoon of honey, butter and a drop of eucalyptus oil. It felt so good, sweet and soothing. My cough would stop and sometimes I wanted to cough again for more of that honey and butter! But butter made my skin break out as a child and so my mom eventually cut butter out of our diet and even though we were vegetarian she was now experimenting more with a pure plant based diet. Well, I have teen boys now, and they are a lot of fun. When they were toddlers and even now, I have followed the same plan. When a sore throat STARTS...take care of it right away. Get your feet, legs, arms, warm. Drink a hot tea. Gargle with salt water. Drink fresh vegetable juice. If someone gets a cough, take some homemade cough syrup or a spoon of honey, coconut oil and tea tree oil. Sometimes I just usehoney and a drop of eucalyptus oil, or another great one is honey and a drop of scotch pine essential oil! So is this all quackery??? Well, a few years ago it was considered so, but not by myself! I have experienced and seen so much healing with SIMPLE, natural, harmless procedures. Let me share something about honey and coughs from published medical literature. There have been several studies which have validated the fact that honey is indeed helpful for coughs, and studies have even verified that a spoonful of honey will help children with upper respiratory infection sleep better and reduce their coughing. -Pediatrics. 2012 Sep;130(3):465-71. doi: 10.1542/peds.2011-3075. Epub 2012 Aug 6. Parents can sleep better with honey too!! I did not need the studies, I have first hand experience! But,...for the doubting Thomas here it is! Next time I will share a homemade cough syrup that really helps with sore throat but is especially effective with laryngitis! Beware though!! This statement has NOT been evaluated by the FDA!!! Read at your own risk!!!! Everything I have learned in life must first be verified by the FDA. "I wish above all things that you would prosper and be in health." 3 John 2. Blessings to all! Enjoy your honey! So we decided to escape the heat in the valley one day this week, we couldn't have made a better choice! Hiking up in the Silver Lake area! Awesome fun! We did notice different flowers that honey bees love and some unique berries too! Our Creator is so awesome, His handiwork is incredible! Our family loves this nutritious breakfast (or dinner) Muesli every summer. Just chop up a big bowl of cold, fresh, sweet peaches, add a generous scoop of ground flaxseeds, a cup of quick oats, chopped nuts, mix and top with raisins and berries!!! Ready to eat, kids love it, so nutritious!! With a slice of homemade bread, what more do we need!!! Have a fun and safe summer! Look at how many bees there are on top of this super! This box is FULL of bees making honey! We will have a really nice super white North Dakota floral honey this year! What a blessing! My friend Terri comes over and shares an exotic new fruit with all our friends-Rambutan. It looks like a kids toy and tastes like a white grape! Yummy, fun, social food! Stacking up the Supers!!! In Clover! 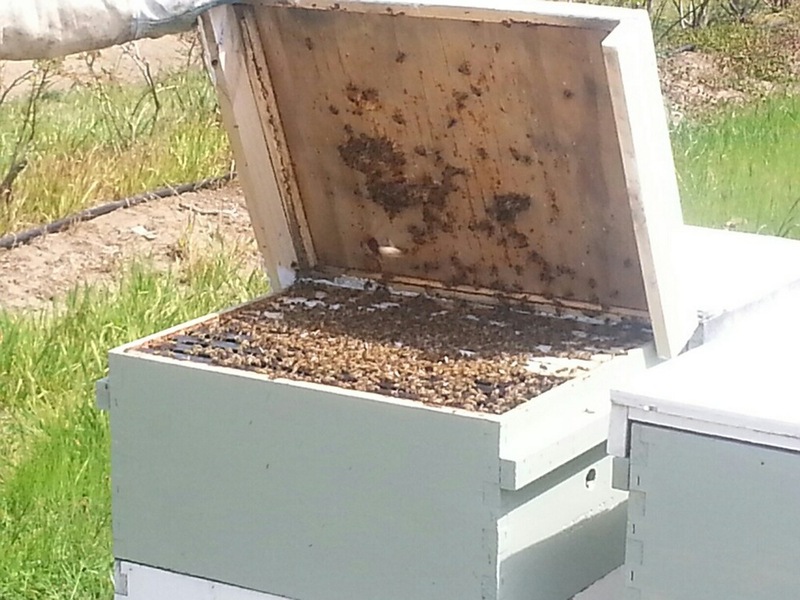 Well here are some of our bee colonies in ND. Excellent year for Clover honey! The lower box is home with the queen mommy, the second box is their food pantry for the family and all upper boxes on top of that is extra honey storage. Look at all the bees flying around in the air. They love beeing busy! The queen loves it and she is busy laying eggs for babies everyday. These busy ladies only live 3 weeks during the honey season so there needs to be a steadily growing family. Our Honey at Loma Linda Market! So happy to be in the neighborhood! Hope our friends in Southern California enjoy nature's sweet gift! Did you know that radish for seed makes real good honey? Some of our bees are working these beautiful fields right now in Oregon. Isn't that so coooool! Gardening and a Sweet Harvest! What a wonderful harvest we are having and so early this year! Perfect tomatoes, no cracking except the birds love them this year too!! We have never had tomatoes this early. Picked our first one in MAY!!! My tomatoes are always late. Had loads of kale and beets just when Charlie needed them for his juices-praise God! Picking a basket full of goodies almost every morning! Thank you Lord! We went for a walk in the foothills around lake Tabeaud and found the lovely Yerba Santa in bloom. Not only do bees and insects love this plant but it is a great blessing to all of us! From the Spanish language we have the name Yerba Santa, or, as we would say in English "Herb Saint". This herb of the high desert mountains in the desert southwest of the US., with its gray-white miniature trumpet flowers, has long been revered by the Spanish community as a life-saving lung herb. The clean refreshing scent and taste of Yerba Santa immediately suggest the relief it affords for removing mucus, draining fluid from lungs and their restoration to normal function. Take internally, 40 to 80 drops per day, or hourly as needed for relief. This may help someone with breathing difficulties to breathe easier. I love chewing on the young leaves, then I spit out the residue. Take a drink of water and it is soooo sweet and refreshing after chewing on YS leaves!! To your health this lovely spring! Keep praying for rain! God is good! All the time. Well, I just kind of threw this together today, there are no measurements but you can figure it out and adapt. 1. Cook up your fresh Udon noodles or fresh Soba according to directions, drain, rinse with cold water, set aside. 2. Have ready a rainbow of colored veggies like carrots, peppers, onions, zucchini, bok choy or cabbage. Cut the veggies in different shapes so some are long strips, some are slices etc. If you have firm tofu, slice that up too. 3. On high heat, Sautee the onion first in water, when it is soft add some sesame oil and some extra light olive oil. Another minute or so and it should start to turn golden. Now add carrots, zucchini, tofu or other veggies, Stir a few moments cover a minute, add soy sauce (careful some add MSG), salt, and honey. Mix up a few more seconds and add your greens like bok choy. Cook just till the veggies wilt a bit, sprinkle red pepper flakes, taste for salt and honey. Should be a little sweet and just right for the salt you know? Decorate with sliced green onion and black sesame seed when you serve. I haven't done that yet on the photo because I am serving this up later. ENJOY folks. I always use honey in my asian cooking instead of sugar! I came to love this beautiful flower the first time I went to Brazil in 1981. It grows everywhere and cheers up the city and the countryside. Bees love this flower but our buzzing ladies never get to taste this nectar because it is a tropical plant. I want to share with you the tremendous benefits of this flower and therefore the benefits of hibiscus tea. WHEN YOU DRINK THIS TEA REMEMBER IT IS HIGH IN VITAMIN C, THEREFORE ACIDIC, TO PROTECT YOUR TEETH AFTER ENJOYING THIS TREMENDOUS HEALTHY BEVERAGE SWISH WITH PURE WATER TO RINSE YOUR MOUTH. DO NOT BRUSH YOUR TEETH FOR 30 MINUTES AFTER EATING OR DRINKING ACIDY FOODS/BEVERAGES, JUST RINSE FIRST. THIS WAY YOU BENEFIT FROM HIBISCUS, LEMON ETC. BUT PROTECT YOUR TEETH AS WELL, AND OF COURSE BUILD A HEALTHY IMMUNE SYSTEM AND BLOOD VESSELS. OH, WHAT A BLESSING TO HAVE ALL THESE WONDERFUL FOODS FOR HEALTH AND HEALING!!! YES, YES! MY OWN NATUROPATHIC MENTOR, THE LATE DR. E. WATKINS HAD THIS TO SAY ABOUT HIBISCUS: HIBISCUS CONTAINS ASTONISHINGLY LARGE AMOUNTS OF TWO VALUABLE TRACE MINERAL ELEMENTS, CHROMIUM AND SELENIUM. WHILE IT IS TRUE THAT MANY SEA VEGETABLES DO CONTAIN THESE TRACE ELEMENTS AS WELL, NO OTHER SINGLE HERB HAS BEEN FOUND WITH LEVELS AS HIGH FOR THESE TWO VITAL TRACE ELEMENTS COMBINED, AS IN THE FLOWER PETALS OF THIS SPLENDID TROPICAL AND SUB-TROPICAL FLOWER. IN ORDER FOR US TO TOLERATE AND USE THE GLUCOSE (BLOOD SUGAR) NORMALLY PRESENT IN OUR BLOOD STREAM, CHROMIUM IS NEEDED SO THE NERVES AND BRAIN CAN FUNCTION PROPERLY. THE BODY MAKES A SUBSTANCE WITH CHROMIUM IN IT CALLED GLUCOSE TOLERANCE FACTOR. WITH THIS THE BODY CAN THEN PRODUCE AND USE THE HORMONE, CORRECTING THE DIS-EASE CONDITION KNOWN AS SUGAR DIABETES. THE TRACE ELEMENT SELENIUM FUNCTIONS MUCH LIKE THE OIL-BASED BITAMIN COMPLEX KNOWN COLLECTIVELY AS VITAMIN E, WHEN IT COMES TO DESTROYING HARMFUL CANCER CAUSING COMPOUNDS IN THE BODY, KNOWN AS "FREE RADICALS". SELENIUM DOES THIS BY PROTECTING THE GENETIC MACHINERY OF THE CELL NUCLEIUS OR "CELL HEADQUARTERS", WHEN IT IS IN THE PROCESS OF DIVISION TO FORM NEW BODY CELLS. SELENIUM ALSO CORRECTS HEART AND CIRCULATORY DIS-EASES BY PREVENTING THE BREAK DOWN OF THE CIRCULATORY SYSTEM. THAT DOC WATKINS WAS A WISE MAN! OK FOLKS, THAT'S IT FOR TODAY, SEE YOU AGAIN NEXT TIME, UNTIL THEN GOD BLESS YOU ALL! Andrew Introduces us to a New Favorite! The Story: Well, on New Year's Day 2015 Andrew, our son, flew south to Guatemala on a mission trip to build a church with locals and 8 other youth from California. It was a great group and rich experience for all of them. When Andrew got home he told us of all the interesting food experiences he had including some delicious cherimoya fruit, sweeeeeet pineapple and he kept talking about this hamaica tea. Well, I figured out that meant Jamaica tea, but in english it is Hibiscus Tea. Well, I have long used hibiscus flowers in my herbal tea creations but never pure, hibiscus tea. Here is the recipe and it is a big hit with our family including 91 year old grandpa (Pampa), he LOOOOOVVVVVEEED it, of course, it has honey in it, is sweet and yummy!!! So here goes the recipe. First off, go to a mexican store and find a big bag of hibiscus flowers, dry, but ask for Jamaica tea(pronounce hamaIca tea). RECIPE Bring to Boil: 4 cups water 2 cups hibiscus flowers 1/2 Cup FLOWING GOLD HONEY!!! Simmer for 15 minutes. Cool. Strain. Add 4 cups water. Drink cool. WOW IT IS GOOD. Tastes like grape, pomegranate and cherry juice! Tomorrow I will share with you why your body NEEDS Hibiscus tea! You may even save someone's life, by sharing what I will share with you. So listen up tomorrow, or rather, read up....... Sweet honey dreams tonight to all! Andrew came home from mission trip and told us about this delicious beverage!